In an epic journey that started over a year ago, Prince George is only a stop along the way for Marcelo Bahamondes who still has a fair bit more to go until he reaches his final destination. 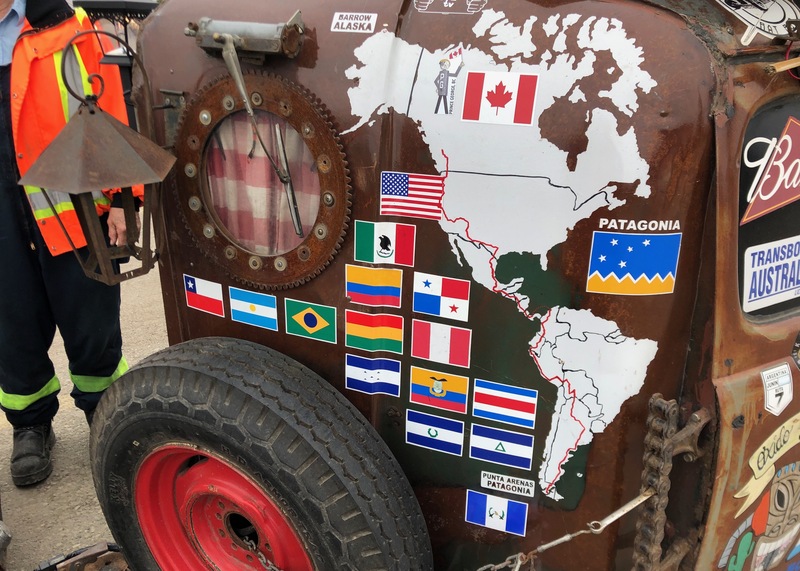 Bahamondes has a goal to drive his handcrafted rat rod from the southern tip of South America in Punta Arenas Chile, all the way to The northern reaches of Alaska in Barrow. When asked by MyPGNow why make the trip he said why not. Many people have stopped by the Superstore parking lot where the car is parked to take pictures of the one of a kind creation before he leaves in the next day or so. Prince George residents and car enthusiast Jim Brown said he was driving by and just had to stop. The car is a hodgepodge of unique items with feature like a Jack Daniel’s bottle for coolant fluid and a 1942 German Tank periscope. The Volkswagen Beetle attached to the back has a mattress, and the vehicle even goes as far as to have solar panels on the roof to provide energy with a tap attached to the side for washing up. To fund this ambitious adventure Bahamondes trades custom stickers in exchange for donations for food and gas. 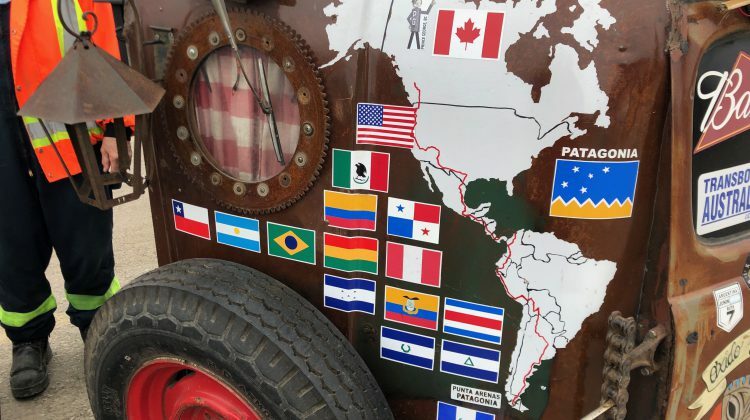 He has been on the road for a year and two months and estimates to get to Alaska and back home his trip will be about three years.